OnePlus recently launched its latest flagship device, the OnePlus 6T which comes with some of the most impressive latest features and has been termed as the “flagship killer”. When the OnePlus 6T debuted in the Indian market, it witnessed massive sales online. The phone boots Android 9 Pie out of the box, with OnePlus’ custom OxygenOS on top of it. However, ever since the launch of the phone, OnePlus has been pushing incremental updates to the latest OxygenOS to make the UI and UX friendlier for the users. There have also been backend updates to the OxygenOS which improve performance and efficiency. Presently, OnePlus has also introduced the new OxygenOS 9.0.7 which brings updates to imaging, audio, wireless connectivity and power efficiency. Notably, the last update which was the OxygenOS 9.0.6 brought improvements to the in-display fingerprint scanner and the unlocking performance of the phone. The OxygenOS 9.0.7 update will be pushed to the users via the over-the-air (OTA) method and like every other update, it will also be rolled out to the users in a phased manner. OnePlus has also uploaded the changelog of the new update which outlines the new features and improvements which the Chinese OEM has brought onboard its latest flagship phone. A significant improvement has been brought to the camera as part of the FPS slow-motion videos. Additionally, the company has also added an ‘Audio Tuner’ for Bluetooth wireless headphones. Using this feature, users of the phone will be able to fine-tune the audio settings whenever they are pairing their phone with wireless audio equipment. Besides the improvements in audio and camera, the OxygenOS 9.0.7 Update also ships improvements in ‘System’ as well. 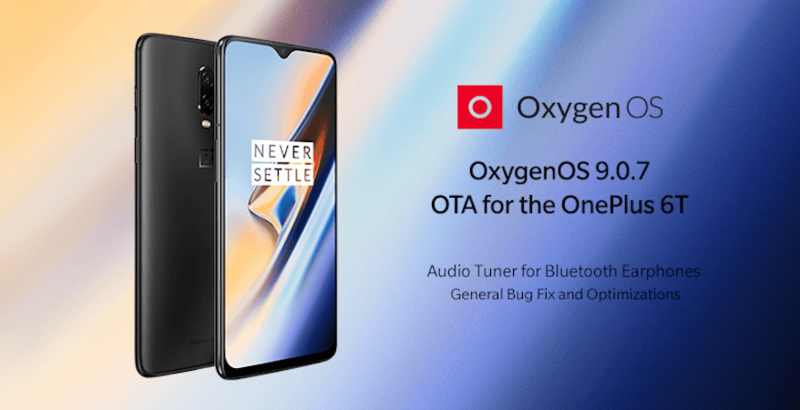 The company has claimed that the new OxygenOS 9.0.7 update brings more stability to Bluetooth connection, and the same has been extended to Wi-Fi as well, thus ensuring better and stable connections on the phone. Undoubtedly, the 3700mAh battery on the OnePlus 6T provides impressive standby time. However, OnePlus was still working to improve the efficiency of the phone and the standby time which the battery offered. Now with this new update, the OnePlus 6T offers improved standby power consumption, which has been implemented by an optimised background power consumption by apps and sensors. Also, in the previous update, OnePlus had optimised the in-display fingerprint sensor, whereas in the recent update OnePlus has reportedly fixed display issues for lock screen wallpaper. OnePlus has also reported that this new update has been rolled out for the global variant of the OnePlus 6T and not the T-Mobile version. The OEM has also asserted that the update will be rolled out in a phased manner and will reach a handful of users in the first iteration, followed by a gradual rollout. Interestingly, OnePlus has grown extensively as a brand in the last few years thanks to its reliable features, latest offerings, and timely software updates. The OEM has worked to provide an extremely user-friendly UI, the OxygenOS which provides just enough features for the users to make their phone experience top-notch. The manufacturer has also worked to provide timely and regular updates to its users to ensure a bug-free experience. Yesterday only received Open Beta 8 on my OnePlus 6.